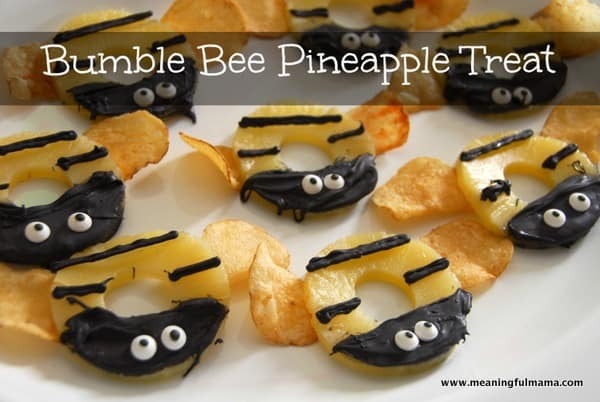 These bumble bee pineapple treats were a great addition to Kenzie’s spring birthday party. 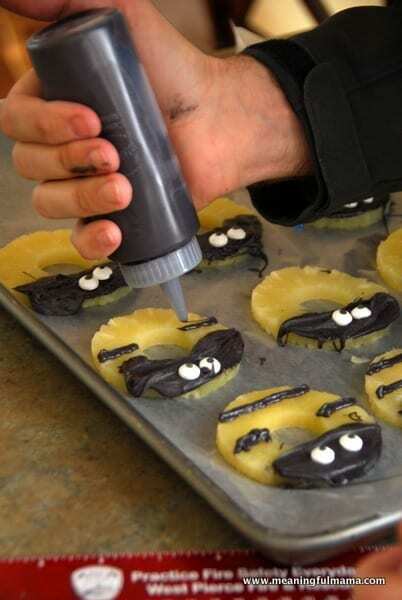 I wanted to create bumble bees with the food somehow, and this fun snack made from pineapple, Candy Melts and potato chips were the solution. They were pretty easy to make. Have you worked with Candy Melts before? They’re easy to use, and I have a tutorial here if you are hesitant. I hope this gives you the confidence to move forward. I simply took the chocolate and smoothed it over one end of the pineapple with a spoon. My husband was working with me and made the stripes from the squeeze bottle. These candy google eyes were found in the cake section of my local craft store and were just stuck into the chocolate. The butterfly wings were made of potato chips. I could have attached them with the chocolate, but I made it simple by just sticking them underneath. The kids would pick up the bumblebee body and then grab the chips that went with it. These are so cute! 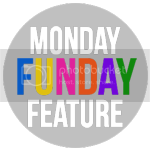 Thanks for sharing them at Monday Funday! I’m pinning them to my food board! So cute! I think they would taste a little strange (to me), but they sure are cute! Thanks for sharing at Mom’s Library! I thought chocolate and pineapple would taste good, but the chips were definitely their own separate snack. The kids din’t seem to mind. Thanks for stopping by, Ashley! These are too adorable! Sweet, salty and cute! I’m a little smitten with anything bee related- ( I “named” my yellow kayak Bee Happy) so i will making these for picnics! Thanks so much! I’m glad you want to try them. Just so you know, they might be hard to pack for picnics. They are great displayed like there were. However, the chocolate did pop off easily, and I’m afraid packing them would make the chocolate slip off before you get them out to people. I’m glad you stopped by!